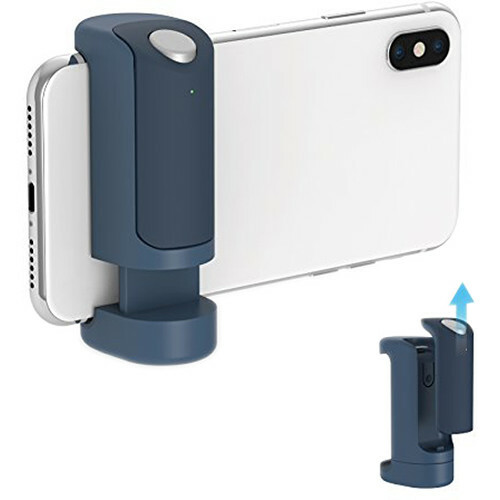 Compatible with most devices running iOS 9.0 and later or Android 5.0 and later, the blue ShutterGrip from Just Mobile pairs itself to your phone using Bluetooth 4.0+ technology and helps transform your smartphone into a serious camera. It physically attaches to your phone using a tensioned grip, which can be attached whether or not your phone is housed in a case, and serves as both a solid, ergonomic handle and a wireless shutter button. Thanks to a tripod screw, lanyard hole, and a non-slip grip, the ShutterGrip helps make the process of attaching accessories more user-friendly. Additionally, its modular design allows the shutter button to be removed and used as a remote control for selfies, videos, and time lapses. All of this helps to eliminate shaky, blurry images and other photographic fumbles. The Just Mobile ShutterGrip automatically turns itself off after three minutes of idling, and will wake up with the press of a button. Included is a wrist strap and a CR2032 battery, which will last for around 180 days, assuming it is used for 500 exposures per day. Protection is provided by a limited one-year warranty. Box Dimensions (LxWxH) 7.8 x 4.45 x 1.7"
ShutterGrip (Blue) is rated 3.4 out of 5 by 11. Rated 5 out of 5 by Howard from Great travel companion. Indispensable for photos of kids. I'm one of the Kickstarter supporters of ShutterGrip and have been using it since December. Love the part where I can share one ShutterGrip amongst my wife and me on our separate trips, since it can be paired and shared to more than one phone. Works great with our iPhone 7 and 6. The trick I used the most is letting my 7yo daughter holding the remote while I grip the camera. She can click (shutter release) when she feels ready. So now I get radiant smiling photos of her in stable shots. Neat! Rated 3 out of 5 by Joseph from 50% success rate This works fine with my wife's iPhone SE but I cannot get it to sync with my iPhone 8 Plus. Rated 5 out of 5 by J from Secure Smartphone Photos The Shuttergrip provides a comfortable and secure way to hold your smartphone when making photos. The provided lanyard just adds to that secure feeling. Also syncs quickly to another phone. Rated 5 out of 5 by Donald from Great It works as advertised. Makes holding my phone and pushing the button feel like more like a camera. Rated 4 out of 5 by Albert from Very Handy Accessory I've now used the ShutterGrip a number of times, both on my phone and off as a remote shutter trigger. Here are my thoughts. Although it easily fits my iPhone 8 Plus with Apple case, it doesn't fit snugly enough to prevent the grip from wiggling a bit side to side. This is not really a problem but I certainly don't feel confident enough to carry my phone around dangling only from the lanyard on this grip. A phone with a thicker case might be fine. The only other minor complain I have is that the removable remote shutter trigger is a bit too easy to remove and can fall off with only a little encouragement. I consider these two issues as minor. Overall I love the ShutterGrip, especially the fact that it has a tripod mount on the bottom, and the Bluetooth trigger range is good. It's small and easy to pack with my gear when I travel, or simply slip into my pocket otherwise. Rated 1 out of 5 by Anonymous from Just mobile NOT WORTH THE MONEY, ESPECIALLY FOR PIXEL XL PHONE, Barely fits on camera, why is there a shuttle button? That does nothing, I should have waited for $10 version, don't pay for it at the current price, this thing barely works for Android, favours IOS owners. Rated 1 out of 5 by William from Worked for about a week I had great hopes for this device and its clever design. Liked that it had a tripod mount and could be used as a remote shutter release. It is treated by the phone a s Bluetooth keyboard so when it's in use you cannot type on your phone (you have to turn off Bluetooth first). After a week of occasional use however, it died. Put in a fresh battery and still nothing. Dead. Rated 1 out of 5 by Piya from Doesn’t support IOS 12.1 No one tells me until after buying and F up my iPhone 8 that it doesn’t work with IOS 12.1 and up. It tells you to “reset all setting” so now I’ve lost all saved passwords and all previous setting. Plus it messed my IPad Pro too because somehow changing your phone setting affects all your IOS devices. Piece of KAka! Does it work on ios 12.1.4 ? Thanks for asking! I followed the links and am happy to see Just Mobile chime in here on the issue. My iPhone 6 running iOS 12.1.2 hasn't been able to use any of the bluetooth functions of the ShutterGrip. Off to Just Mobile support to start my firmware upgrade. Does the shutter button work for videos on the iOS camera app? Yes. Set your app to the video mode and the button will start and end video-taking.